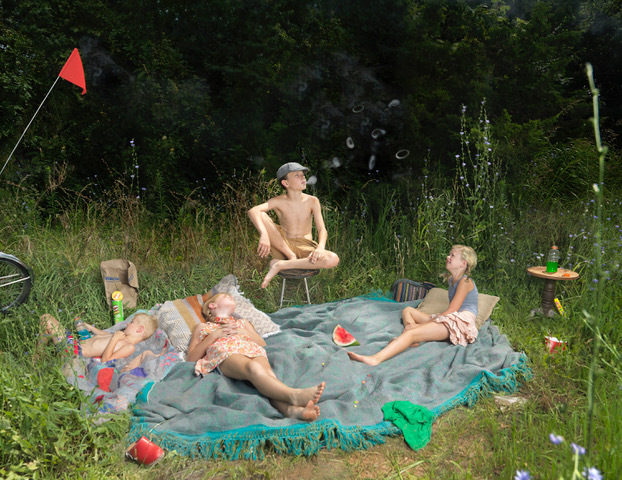 Robert Mann Gallery is pleased to announce “Midwest Materials,” a limited-run pop-up show by Julie Blackmon presented in Bentonville, Arkansas. Following the success of her most recent solo exhibition, “Fake Weather,” which was exhibited in New York and Boston, Blackmon brings a collection of her newest works back to her roots. This special exhibition of photographs exemplify Blackmon’s signature style of compelling visual allure and subtly off-kilter incidents fused together with sly wit into strange, wry, and whimsical stories of everyday moments. Though her newest work probes the fever dreams of a restless nation and make more direct pokes at our consumer culture, the title piece of the exhibition, Midwest Materials, shows Blackmon reflecting back to her own community, which has been the source for so much inspiration and support. 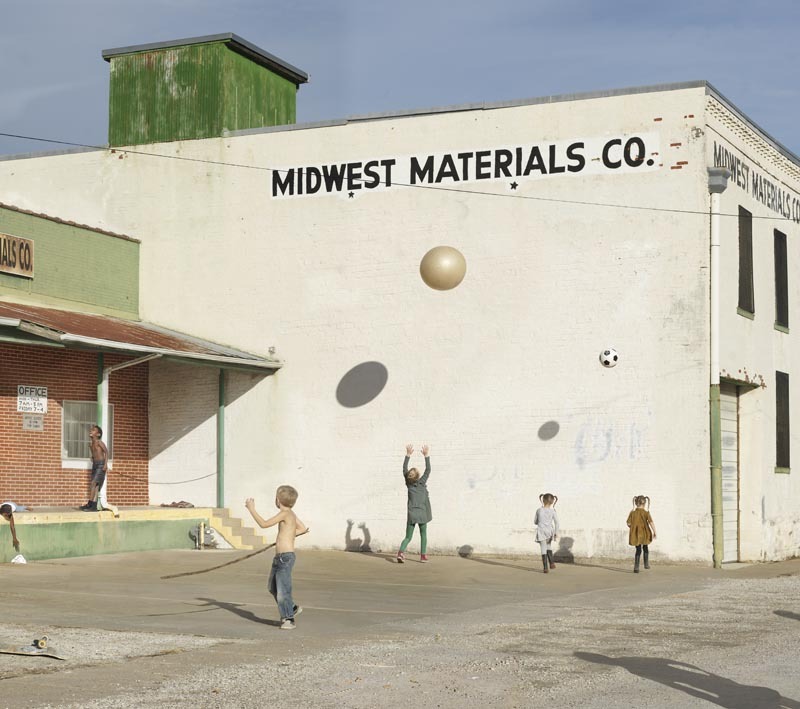 Within Midwest Materials, viewers get a sense of nostalgia for the imagination of youth, where sticks are used as swords and an empty lot becomes the soccer field of the World Cup. It is that same imagination that drives Blackmon’s work and the material that drive her photographs into new realms. Julie Blackmon lives and works in Springfield, Missouri. The artistʼs work is included in numerous museums and public collections including that of the George Eastman House; Nelson Atkins Museum of Art; Museum of Fine Arts, Houston; Kemper Museum of Contemporary Art, Kansas City; the Portland Art Museum; and the Musée Français de la Photographie in Bièvres, France. She was named American Photo's "Emerging Photographer of 2008" and one of PDN's "30 New and Emerging Photographers" in 2007, and has been the recipient of various awards including first prize from The Santa Fe Center for Photography in the Project Competition in 2006. Blackmon has published two monographs, her first of which sold out, Domestic Vacations (Radius Press, 2008) and Homegrown (Radius Press co-published with Robert Mann Gallery, 2014). For additional information and press materials, contact the gallery by telephone (212.989.7600) or by email (mail@robertmann.com). Robert Mann Gallery in New York will present the newest exhibition from artist Julie Blackmon through the end of July at a pop-up space on the Bentonville downtown square. "Midwest Materials" is an exploration of "the mythical in the ordinary" of Blackmon's life as she and her four sisters raise children in the Ozarks in the 21st century through fictional images. The award-winning artist took a few minutes to answer these questions for 'SUP. Visit nwaonline.com/features/whatsup for the full interview. Photographer and native Springfieldian Julie Blackmon is a recognizable name outside the region, yet she still lives and works right here in 417-land. You can see her art on the walls at Druff’s in downtown Springfield, and she has had work featured in Time and The New Yorker. Just in time for a summer getaway, Blackmon brings a limited-run pop-up show to Bentonville, Arkansas. “Midwest Materials,” is on display June 22 through July 28 on the Bentonville square. The gallery is open Thursday through Saturday from noon to 8 p.m. Just two hours south of Springfield, Bentonville is known for its art community and food scene.